Here he is!! 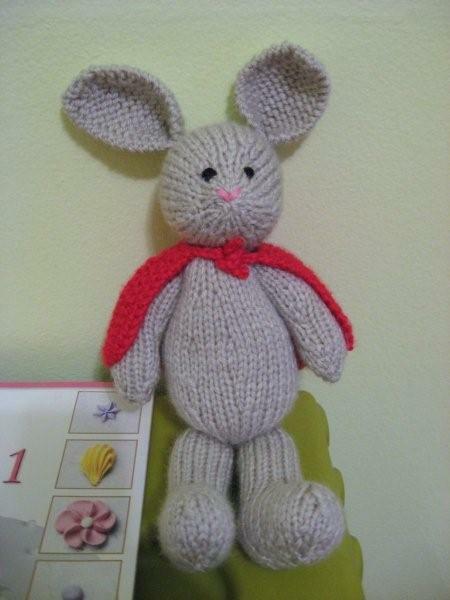 A Super Hero Bunny for my Little Man on Easter. Needles: Size 6 Dps-just because i wanted shorter needles to knit with. She also uses skpo for decreasing and i think next time i would use ssk instead-to me it looks a little bit neater but that is just personal preference. He turned out pretty cute-I really had to mold his head-it didnt look anything like the pattern after i first stuffed it. I originally started out with the Fuzzy Lamb pattern also by Fuzzy Mitten-this is her free pattern. i was going to do it for practice but my extra time got sucked by the illness and so i had to go straight to the bunny before i could finish the lamb-but all i have to do is seam, stuff and put him together. Next week hopefully-i got some busy days coming. Happy First Day of Spring to you all-hope someone out there has some warm weather-we have cold today and snow coming tonight-not spring-like AT ALL!! VERY cute!! Was the pattern free?? That SuperBunny is the cutest!! Little Man will love it! Are you just trying to rub it in my face that you finished yours??? 🙂 Annabelle just keeps asking, “where’s my chocolate bunny?” This is adorable… great job!